The logic behind this is that the salt will soak up the stain. The salt may start to draw up the liquid (if it is a liquid stain). However, it really is not the best method of stain removal. The salt is unable to absorb everything and it is likely you will be left with residue that still needs cleaning. The salt itself can also then provide a challenge to remove. It is likely that you will see the colour of the red wine dispersing when white wine is poured onto it. Effectively it is doing exactly what water would do in the same application. The best advice here is to save your white wine for another occasion and use tried and tested methods. It is reasonable to believe that there may be some cases where this approach may help stain removal. However, you would need vast expertise and knowledge of exact amounts and in what applications it may work. Better advice would be to use water and a blotting technique first. Please note: as a general rule it is really important to not make the stain more of a challenge to fully remove. Remember anything that you put onto your carpet then needs to be removed as well. Some products promise unrealistic or unreasonable results. Some products are too generic and can burn wool fibres or strip protective coatings of other carpets. It is always a good idea to test on an inconspicuous area of your carpet prior to application on an area you can see. A better approach is knowing exactly what techniques and products work for individual stains. Remember, we have tailored and specialist approaches for removing carpet stains. 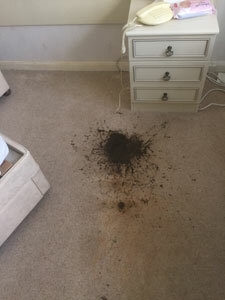 These are used frequently and work to fully remove the stain, leave your carpet fibres undamaged and remove all residue so that further staining will not occur. If you would like to book in carpet cleaning or a carpet stain removal service please call 0800 695 1118.